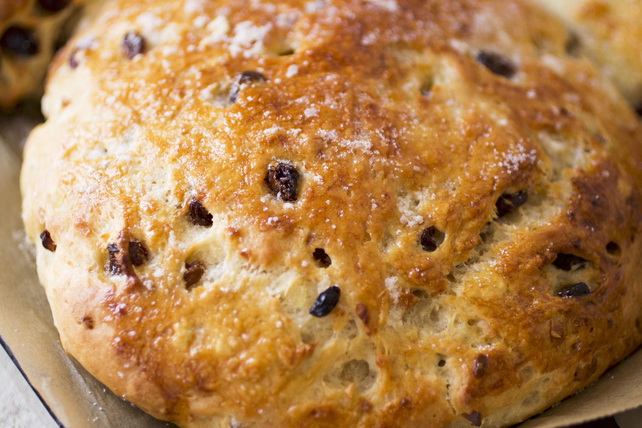 Our recipe for Soda Bread with Raisins is wonderfully light and buttery. Delicious straight from the oven, or toasted. Bonus - it's ready to enjoy in no time! Combine flour, 1/4 cup (4 Tbsp.) sugar, baking powder, baking soda and salt in large bowl. Cut in butter with pastry blender or 2 knives until mixture resembles coarse crumbs. Make well in centre of flour mixture. Add buttermilk. Gradually stir in flour mixture just until blended. Stir in raisins. Shape dough into ball with lightly floured hands. Place on parchment-covered baking sheet; sprinkle with remaining sugar. Bake 35 min. or until top is golden brown and toothpick inserted in centre comes out clean. Cool bread 10 min. Transfer to wire rack; cool completely. Add 1/3 cup chopped toasted walnuts or almonds to dough along with the raisins. If you don't have buttermilk on hand, pour 2 tsp. Heinz Distilled White Vinegar into 1-cup liquid measuring cup. Add enough milk to measure 1 cup. Let stand 10 min. Stir before using as directed.